As health professionals, nurses have an obligation to be actively involved in leading policy changes that improve health. As Policy Entrepreneurs, nurses can advocate for stronger policies to address countless public health concerns by applying the Multiple Streams Framework approach. In this article, the authors explain the concept of policy entrepreneurship, describe the purpose of their quality improvement project involving the reduction of motor vehicle crashes in a rural, Midwest community in the United States, and then discuss process considerations and project outcomes. They also summarize and interpret the outcomes, share the project limitations and facilitators, and conclude that the Multiple Streams Framework approach is an effective process for nurses to use in bringing about change. They note that in accomplishing their goal, which involved merging a community problem, community policy, and community political streams, they created a new nursing role, specifically that of a Nurse Policy Entrepreneur (NPE). Implementing this role enabled them to gain judicial approval for a teen-driver-offender policy change to make their community a safer place. Citation: Gregg, J., Miller, J., Tennant, K.F., (July 31, 2018) "Nurse Policy Entrepreneurship in a Rural Community: A Multiple Streams Framework Approach" OJIN: The Online Journal of Issues in Nursing Vol. 23, No. 3. In 2011, the Institute of Medicine (IOM), now the National Academy of Medicine, called for nurses to be policy participants for change and not merely spectators (IOM, 2011). As members of the largest healthcare profession, nurses are in a unique position to effect policy decisions and changes. According to Patton, Zalon, and Ludwick (2015), nurses are not only suitable, but also professionally obligated to be involved in policy making. In addition, the International Council of Nurses and the World Health Organization have stated that nurses need to be involved in policy, as they are the professionals who work most closely with clients needing healthcare. Nurses today are able to advocate for stronger policies to influence countless public health concerns through the role of Nurse Policy Entrepreneur. The value of nurses will be demonstrated more fully as nurses become increasingly involved in developing policies that improve care to benefit clients, families, and society (Kunaviktikul, 2014). Nurses historically have been involved with policy changes related to their own scope of practice. However, nurses can do even more in the political realm as they increase their use of patient experiences to advocate for patients in the legislative arena (Maryland & Gonzalez, 2012). Nurses today are able to advocate for stronger policies to influence countless public health concerns through the role of Nurse Policy Entrepreneur (NPE). Theoretically anyone, including politicians, lobbyists, or private citizens, can serve as health-related-policy entrepreneurs. However, nurses, and through them the profession of nursing will be able to impact policy more intentionally and more effectively by embracing this new role of NPE. The role of a policy entrepreneur includes defining and reframing problems, devising possible alternatives, and facilitating agenda setting with decision makers. A policy entrepreneur helps to define a problem and understand the political climate related to the concern, as well as build teams and provide leadership to address significant health issues (Mintrom & Norman, 2009). While nursing literature about the role of policy entrepreneurship within nursing is limited, the concept has been described in the general, healthcare-policy literature through several national and international studies. The role of a policy entrepreneur includes defining and reframing problems, devising possible alternatives, and facilitating agenda setting with decision makers (Kingdon, 2010). Four elements central to policy entrepreneurship include: creating community insight to take advantage of windows of opportunity; effectively defining problems; working well with others as team players; and leading by example to reduce perceived risks for the group (Mintrom & Norman, 2009). The three steams flow independently until a window of opportunity is presented through the facilitation of a policy entrepreneur. The Multiple Streams Framework, created by John Kingdon (2010), describes policy making in terms of problem, policy, and political streams. The problem stream refers to all the issues that need considered before action occurs, whereas the policy stream is related to all the alternative and possible solutions to solve the problem. Finally, the political stream represents the attitude and ideology of both the public and the community decision makers. The three steams flow independently until a window of opportunity is presented through the facilitation of a policy entrepreneur. When two or more of these 'multiple streams' flow together, an opportunity for policy change, called a policy window of opportunity, can be created (Kingdon, 2010). This policy window can result in agenda setting, decision making, and/or actual implementation of an intervention. The Multiple Streams Framework approach theorizes that when the policy entrepreneur is able to bring multiple streams together, a policy window of opportunity, which can result in policy change, is opened at least for a time (Petridou, 2014). Policy entrepreneurs are needed to connect the problem, policy, and political streams and to search for windows of opportunity through their networks and knowledge of the process to create action (Soderberg & Wikstorm, 2015). Policy entrepreneurship has been credited with raising awareness of issues and proactively creating policy alternatives, as well as providing a roadmap for future policy leaders (Craig, Felix, Walker, & Phillips, 2010). Policy entrepreneurs can also add legitimacy and decrease uncertainty during the project implementation process (Soderberg & Wikstorm, 2015). Policy entrepreneurs who are able to promote convergence during a policy window have the ability to strengthen collaboration and are more successful in creating change (Gwozdek, Tetrick, & Shaefer, 2014). Soderberg and Wikstorm (2015) have attributed the success of policy entrepreneurs to close access to policymakers; taking action when the opportunity arises; demonstrating their ability to use networks; and possessing expertise on the subject. Policy entrepreneurship has been described in several studies through the lens of the Multiple Streams Framework. Craig et al. (2010) provided a historical analysis to explain how comprehensive, school-based, childhood-obesity legislation was passed in Arkansas. They have explained how, by applying the Multiple Streams Framework Approach, the problem, policy, and political streams combined with the assistance of policy entrepreneurs to produce a policy window that facilitated comprehensive obesity legislation, and provided a roadmap for future policy leaders (Craig et al., 2010). Another study by Abiola, Colgrove, and Mello (2013) applied the Multiple Streams Framework using thematic content analysis of key informant interviews, newspaper articles, and archived data to describe the formation of a Human Papilloma Virus (HPV) immunization policy. These authors found policy entrepreneurship played a vital role in policy outcomes. Similar methodologies and findings have been demonstrated to advance oral health, health promotion, and tobacco legislation (Greathouse, Hahn, Okoli, Warnick & Riker, 2005; Gwozdek et al., 2014; Mamudu et al., 2014; Milton & Grix, 2015). The role of a policy entrepreneur in influencing the policy process is well documented (Craig et al., 2010; Abiola, Colgrove, & Mello, 2013; Milton & Grix, 2015). However, nurses have yet to expand and universally embrace this active role personally so as to improve health policies at all levels of care. Nurses already possess the ability for assessment; people skills; and leadership capabilities needed for an active role in policy making. Additionally, ranked as the most honest and ethical profession for the last 16 years according to 2017 Gallup Polls (Brenan, 2017), nurses have untapped influence to expedite public and political trust. These many attributes position nurses to lead policy change and facilitate solutions for population health issues by applying the Multiple Stream Approach as a Nurse Policy Entrepreneur (NPE). ...use of this approach is not enough to resolve the problem... active participation by healthcare professionals is also needed to expedite change. The Multiple Streams Framework approach has been used to address healthcare issues. However, healthcare professionals often have not been involved as the policy entrepreneur in these endeavors. Although, one retrospective historical analysis from secondary data did explore the role of public health professionals as policy entrepreneurs in addressing the issue of childhood obesity, a political entity was credited as the primary policy entrepreneur, rather than a health professional (Craig et al., 2010). Walhart (2013) used the Multiple Streams Framwork approach to evaluate and explain the issue of human papillomavirus-related intraepithelial neoplasia, but did not seek to merge the streams to create an actual policy window. Another study applied the Multiple Streams Framework to describe policy related to hospital-associated infections, but nurses were not active participants in the study (Odom-Forren & Hahn, 2006). Internationally, the Multiple Streams Framework approach has been used retrospectively to chronicle health policy changes in Ghana between the years 2000 and 2003; however, the study was completed by political scientists (Owuraku, Church, Conteh, & Heinmiller, 2015). While it is helpful to use the Multiple Streams Framework approach to understand the comprehensive issues of a problematic situation, use of this approach is not enough to resolve the problem. Rather, active participation by healthcare professionals is also needed to expedite change. The NPE reviewed current policies and met with stakeholders to brainstorm potential solutions to create a window for policy change to reduce MVC fatalities... The purpose of this project was to implement and examine the role of a NPE to reduce motor vehicle crashes (MVCs) in a rural community. Applying the Multiple Streams Framework approach, the first author, functioning as the NPE, gathered data to explore specific contributing factors and issues related to motor vehicle crashes in a rural community. The NPE reviewed current policies and met with stakeholders to brainstorm potential solutions to create a window for policy change to reduce MVC fatalities by facilitating the adoption of a stronger policy. In this section, we will discuss issues and considerations that need to be addressed to develop new or revised policies. These considerations include ethical issues, the setting, and planning the intervention. Permission to conduct this study was obtained from the involved (focus) county health department; expedited approval was granted by the Carlow University Institutional Review Board. This quality improvement project posed minimal to no risk to human subjects. Participants were autonomous adult members with the right to decline or withdraw from participation at any time. Written informed consent was provided by all in attendance prior to a coalition meeting. All data was secured in a locked desk or locked computer file and was destroyed upon completion of the project. Participant confidentiality was maintained through anonymity of participants in all surveys/reports by numbering all written information without identifying names. At the conclusion of the project, outcomes were shared with the key stakeholders involved with the actual administration of the program, including Ohio State University Extension agents who oversee the local 4-H programs and the State Highway Patrol. Other stakeholders who were informed included members of the Safe Community Coalition consisting of both health department members and local law enforcement personnel. While the community had worked together effectively on many modifiable health concerns, MVCs had not been evaluated on a coordinated, county level. In the focus county, a non-Appalachian, rural area, in the Midwestern part of the United States, motor vehicle crashes (MVCs) were considered a minor to moderate issue by the county residents, even though reported motor vehicle mortality rates were higher than state and national benchmarks. In addition, according to the 2015 County Health Rankings & Roadmaps, 61% of county driving deaths were related to alcohol impairment. While both the health commissioner and local law enforcement expressed concern about the prevalence of motor vehicle crashes, MVCs were not currently on the local policy agenda and were only addressed through limited, isolated initiatives. Although the county had limited financial resources, a strong sense of civic involvement prevailed. Deliberate actions were needed to raise problem awareness and help set the policy agenda related to decreasing MVCs in the focus county. While the community had worked together effectively on many modifiable health concerns, MVCs had not been evaluated on a coordinated, county level. The county health commissioner requested study of MVCs so as to facilitate community dialogue and begin to address this issue. The nurses who planned and conducted this project had the following aims: to improve a community situation impacting health and to learn about the role of the nurse as a policy entrepreneur. Quality improvement measures were aligned with the Multiple Streams Framework (see Figure 1, developed by the authors). The project was completed over a four month time period, resulting in an approved local policy change (see Figure 2). 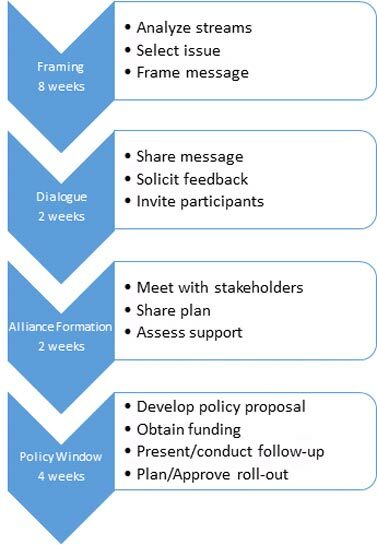 To facilitate an open policy window, the project consisted of three distinct phases: initial framing; dialogue with stakeholders; and alliance formation. Proper framing of the issue required a systematic analysis of the problem, policy, and political streams. The first two months of the project entailed reviewing public data to determine the most significant issue related to MVCs that could be addressed with a local-level (community) policy decision. Proper framing of the issue required a systematic analysis of the problem, policy, and political streams. Problem Stream. The NPE began the project with a review of public, online, county-crash data from 2013-2015. Data reviewed included statistics for: general, crash, injury and death, driver, vehicle, alcohol, and city/village records. Although preliminary data had suggested alcohol as a primary issue, impaired driving was not validated as a predominant issue through the evaluation of online data and/or stakeholder input. The four leading issues related to MVCs in the county were identified as: teen driving injury crash rates; increased mature driver fatalities; seat belt compliance; and motorcycle safety. These four issues were also compared with state and Healthy People 2020 baseline data (see Table). Note: Data adapted from the Ohio Department of Public Service Crash Reports 2013-2014 and 2010 Census data. To create a policy window to address this problem, the NPE analyzed the current, local, policy stream for teen driving violations. Overall findings were validated with several key informants, including the health commissioner, a county deputy sheriff, a state trooper, and the county chair for the Safe Communities Coalition. All informants verified the findings and agreed with the identified priority areas. To further validate and mitigate these issues, peer county data was also reviewed for comparable analysis. Since the other issues identified would require a state level policy change, the issue of teen driver injury crashes was selected for this project. This issue would be addressed through a local-level policy change. To create a policy window to address this problem, the NPE analyzed the current, local, policy stream for teen driving violations. Policy Stream. While the state has a graduated driver’s license (GDL) in place for teen drivers, local enforcement of GDL requirements and overall traffic violations are left to county judicial discretion. Even though more stringent penalties were permitted, the current, local policy in the focus county related to first-time, teen-moving violations did not include any fines or loss of driving privileges. Teen violators were ordered to attend a defensive driving program held at a local racetrack that focused on collision avoidance techniques; loss-of-control recovery skills; bad weather maneuvers through emergency lane change; wet braking; and skid car drills. Upon further evaluation by the NPE of peer counties related to teen injury crashes, all but three peer counties had a Caution and Responsibility in Teenagers (CARTEENS) program in place. Of those with a CARTEENS program, all but one county had a lower percentage of teen MVC injury crashes than counties that did not participate in a CARTEENS program (see Figure 3). Figure 3. Percentage of Teen Injury Crashes in Peer Counties, Adapted from Ohio Department of Public Safety data 2012-2015. The CARTEENS program began in Ohio in 1987 within the 4-H (Head, Heart, Hands, Health) organization, a national youth organization which encourages active learning, mentoring and leadership development of young people in both urban and rural areas. In this rural county, 4-H is very active year around through learning projects, leadership development, and community service. The CARTEENS program is led by teen leaders with oversight from 4-H partners in conjunction with the State Highway Patrol. The goals of the program are to reduce the number of repeat juvenile traffic offenders, decrease the number of teen traffic offenders, and increase teen awareness of traffic/vehicular safety. Program topics include excessive speed, driving under the influence, seat belt safety use, consequences of unsafe decisions, dealing with peer pressure, understanding traffic laws, and recognizing and reacting to traffic signs and signals (Ohio 4-H Youth Development, 2016). The county 4-H director confirmed that the county had had an active CARTEENS program for about 10 years, before the juvenile court began mandating a different course, one that focused on defensive driving, about 15 years ago. The local 4-H director stated the program could be easily reestablished and, and that it would have support from the 4-H community and the State Highway Patrol. Although the juvenile judge was replaced, the reinstatement of CARTEENS had not been proposed to date. Identification of stakeholders who could influence the adoption of a policy to reinstate CARTEENS in the county involved input from key informants; stakeholder analysis; and validation from the County Health Commissioner...Political Stream. Identification of stakeholders who could influence the adoption of a policy to reinstate CARTEENS in the county involved input from key informants; stakeholder analysis; and validation from the County Health Commissioner, who served as the community expert. Multiple levels of input provided data triangulation, for cross verification of issue implications. Key stakeholders who were identified included the local 4-H director and the State Highway Patrol, who would be involved with the actual administration of the program. Other stakeholders involved members of the Safe Community Coalition, which included health department members, emergency medical services (EMS) personnel, and local law enforcement. The NPE needed support from identified stakeholders to build momentum and credibility for the issue and the proposed solution, even though the ultimate decision would be made by the current juvenile judge. A clear concise message was formed by the NPE, and included the following points: 1 of 5 injury crashes over the last 3 years involved a teen in the county; of 13 peer counties, the focus county had the highest percentage of teen injury crashes; and the need for reestablishment of CARTEENS. This message generated positive verbal feedback when shared with the community expert and the chairperson of the Safe Communities Coalition. A clear concise message was formed by the NPE... The NPE had an opportunity to briefly present at the Safe Communities Coalition Fatality Review Board, where she introduced the issue, sought input and solicited interest for a follow-up meeting. The NPE also met with twelve representatives from law enforcement, as well as EMS, health department, and other community leaders, many of whom had been identified as stakeholders. A call for volunteers to join the coalition was then solicited. Eight potential members signed the coalition interest sheet and provided contact information. An additional invitation to meet privately prior to the coalition meeting was extended verbally and in a follow- up email. However, no requests were received for an individual meeting. Prior to the alliance meeting, data were prepared and validated with the key stakeholder from 4-H and the community expert. Invitations to attend the alliance meeting were emailed to all stakeholders who had expressed interest. All members requested information updates as the policy progressed. Nine stakeholders (or their representative) attended the alliance meeting. After introductions, the voluntary participants received information about the purpose and scope of the project and signed for informed consent. Data were presented through individual handouts and a presentation, followed by frank and open collegialdiscussion. Unanimous support was offered for the proposal and the timeline was verbalized. All members requested information updates as the policy progressed. With overall support from the stakeholders, the next step in the progression of the project was to propose the policy to the judge. Steps to prepare for the judicial meeting included: drafting a policy; further exploration of the CARTEENS program; and developing a personal presentation for the judge. The NPE prepared the policy proposal and distributed it to all coalition members, resulting in unanimous support. In addition, the NPE met with the State Program Director for CARTEENS to review actual materials used during a program. During the discussion, the NPE was able to secure a $600 grant for the county to offset startup costs, if CARTEENS was reinstated during the current year. The NPE prepared the policy proposal and distributed it to all coalition members... The NPE requested and was granted personal meeting with the judge. The judge’s initial response was cautiously positive with a commitment for review of the folder with the proposed policy and important talking points that had been was provided by the NPE. Two weeks later, the judge requested a follow-up meeting with the NPE and the local 4-H director to announce the reinstatement of the CARTEENS program. Plans to roll out the program were discussed with final details to be determined by the local 4-H director in collaboration with the State Highway Patrol and the Juvenile Courts. All stakeholders involved in the coalition meeting were informed of the policy change to reinstate the CARTEENS program. It was agreed that ongoing evaluation of the program would be provided to the judge by the CARTEENS program on a monthly basis and the rate of teen injury MVCs would be monitored over the next three years to validate the impact of the local program. This project demonstrated the successful role of a NPE to influence a local policy change that focused on reducing teen injury crashes in a rural community using the Multiple Streams Framework approach. Specific aims achieved included the development of a list of priority issues based on local data; identification of stakeholders; and deliberate discussions about a needed policy change. Attainment of these objectives led to development and approval of a stronger policy related to teen driver violations. In addition, an ongoing coalition was formed by the local 4-H to oversee a new program to improve teen driving safety for all first time offenders. This program will continue to be evaluated for effectiveness. Through thoughtful evaluation involving all three streams, the development of the framed issue facilitated an open policy window. A particular strength of the project was the careful application of the Multiple Streams Framework that facilitated a careful, focused analysis of the issues related to MVCs. Through thoughtful evaluation involving all three streams, the development of the framed issue facilitated an open policy window. Initially in the project, alcohol-related fatalities appeared to be a primary problem based on County Health Rankings. However, once alcohol statistics were carefully reviewed, skewed statistical data became apparent. In 2013, the county reported only three alcohol-related fatalities, thus resulting an inflated statistical average in County Health Rankings. The actual percentage of alcohol impaired drivers accounted for only 4.77% of all crashes, well below state and peer county statistics and not an overarching concern for the county. Overall, both the number of alcohol-related fatality and injury crashes for the three year period reviewed revealed a downward trend. This did not support the initial assumption that alcohol related crashes were the primary issue in the focus county. Without the application of this approach, premature conclusion based upon superficial findings of alcohol-related fatalities could have led to a superfluous policy change related to stronger, and unwarranted, drunk driving penalties. A policy entrepreneur is able to define problems effectively, work with others, lead by example, and discern community perceptions to influence policy windows (Mintrom & Norman, 2009). The successful adoption of this new policy was facilitated by the deliberate application of the Multiple Streams Framework approach by the NPE, so as to open the policy window. Even though there was an ambiguous awareness of various issues related to MVCs in the county prior to this project, no one in the community had facilitated discussions and follow-through to assess contributing factors until the NPE began to explore the problem, the policy, and the political stream. Once data were analyzed and the issue framed, the NPE was able serve as a catalyst to facilitate change in the local policy arena. The results of this project are in line with process findings related to use of the Multiple Streams Framework approach for previous studies. However, a significant variation in this particular situation relates to the role of a nurse working as an independent policy entrepreneur to impact the health of the local community. The innovative role of a NPE in this project led to the defining and reframing of the MVC issues in a rural community. The innovative role of a NPE in this project led to the defining and reframing of the MVC issues in a rural community. This role was facilitated by the prior involvement of the NPE on numerous other community committees and projects, thus expanding established community level relationships to improve the issue of MVCs. In addition, endorsement of the project by the county health commissioner, a well-respected member of the community, provided credibility. Building on preexisting strong civic engagement, policy and program alternatives were discussed. This effort led to an approved local policy change that will positively affect teen health in the community. Although the county had previously established collaborative efforts on many issues, the impact of this project has already improved community cooperation in many ways. A new ongoing coalition between the local 4-H program, the State Highway Patrol, and the Juvenile Court system has been formed to oversee the CARTEENS program. In addition, the CARTEENS program itself will enable the development of leadership skills through training teen leaders to become Peer CARTEENS Instructors. While the grant from the State CARTEENS program will fund startup costs, actual ongoing programing costs will be paid through participant attendance fees. Although this project was completed in a small rural community, the principles of the Multiple Stream Approach can be applied to any issue at any organizational, local, state, national, or international level. One factor that accelerated the success of this project was previously established, strong relationships within the county which facilitated interdisciplinary collaboration. Even though pre-existing associations are not essential to successful outcomes, good working relationships both mitigate resistance to change when applying the Multiple Streams Framework approach and expedite collaboration. As professionals with passion for improving the health of others, nurses are a valuable resource to increase awareness and assist in determining the best policy and program solutions for important health-related issues. Following a passion for community health, the NPE in this project sought to change policy related to motor vehicle crashes, the leading cause of unintentional-injury death among children under the age of 19, according the Centers for Disease Control and Prevention (CDC, 2016). Through awareness, nurses can impact community health issues within their places of work, local community, and higher levels of government by embracing the role of the NPE and systematically applying the Multiple Stream Framework. By assuming the role of NPE, all professional nurses can learn how to impact health policy effectively. Yet, most nurses appear to have limited knowledge about how to strategically impact health policy, due to limited examples of policy-making models in the nursing literature. Empowered nurses help to create beneficial policy that results in positive outcomes to improve health. By assuming the role of NPE, all professional nurses can learn how to impact health policy effectively. The Multiple Streams Framework approach is easy to use and understand once nurses are exposed to the process. We encourage nurse educators and nursing organizations to further disseminate information about the Multiple Stream Approach and the role of the NPE to enculturate nurses to become political partners that influence all levels of healthcare as part of their professional responsibility. Suggested next steps include further implementation of the role of the NPE and application of the Multiple Streams Framework approach by nurses in a variety of healthcare settings, including schools of nursing and professional conferences. The Multiple Streams Framework is a valuable tool that can successfully guide nurses to change policy in healthcare at any level of policy change and in any setting. We need to continue to explore this valuable tool, along with the further development of the role of a NPE. Although not every nurse will influence policy on a national level, every nurse can begin to impact local health policy today. As the call to nurses for active participation in health policy continues to resound, strategies to facilitate this NPE role are needed. Although not every nurse will influence policy on a national level, every nurse can begin to impact local health policy today. Nurses can start by identifying one health issue they are passionate about in their own community. Once selected, full analysis of the issue through the lens of the Multiple Streams Framework with care to avoid premature conclusions without validating data is needed. After the issue is fully understood, the nurse, functioning as a NPE, is ready to begin practicing leadership, advocacy, and teambuilding skills, thus impacting local policy by forming community alliances. Although the impact of these individual local initiatives may appear small in scope, the exponential collective effect of the nearly 4 million registered nurses reported by National Council of State Boards of Nursing (2018), each leading one individual initiative, would be substantial and significant. Nurses must expand their scope of practice to include leading health policy improvements. As professionals, it is essential for nurses to become more familiar with policy making to become active participants in leading the changes that will improve the health of their communities. Once nurses understand how policy making works, why they need to become involved, and how they can become part of this decision-making process through their role as a NPE, nurses will be able to make a stronger impact on health policy and improve the health of the population(s) for which they care. Judy Gregg is an Assistant Professor of Nursing at Mount Vernon Nazarene University (MVNU) in Mount Vernon, Ohio. For the past seven years, she has taught Population Health and Nursing Leadership in both the traditional and the RN to BSN programs. She also serves as an active member on several Knox County Community Health Committees. Dr. Gregg holds a master’s degree in Community Health Nursing from Indiana Wesleyan University, headquartered in Marion, Indiana, and a Doctorate of Nursing Practice from Carlow University in Pittsburgh, Pennsylvania. Julie Miller has led Knox County (Ohio) Health Department as the Health Commissioner since September 2010. She has over 40 years of varied healthcare experiences including roles as an administrator, a nursing educator, and as a public health professional. Ms. Miller earned her BSN and MSN degrees from Otterbein University in Westerville, Ohio. Dr. Tennant is an Associate Professor of Nursing at Carlow University in Pittsburgh, PA where she teaches in the MSN & DNP nursing programs and serves as a faculty chair/mentor for DNP student scholarly projects. Her areas of interest include cultural competency, global health, rural health and geriatric nursing. Dr. Tennant graduated from the West Virginia School of Nursing in Morgantown, West Virginia, as an Adult Nurse Practitioner with a graduate certificate in gerontology. She earned her PhD degree from Ohio University in Athens, Ohio, in Higher Education Administration with a minor in Research & Evaluation and Health Service Administration. Gwozdek, A. E., Tetrick, R., & Shaefer, H. L. (2014). The origins of Minnesota’s mid-level dental practitioner: Alignment of problem, political and policy streams. Journal of Dental Hygiene, 88(5), 292-301. Kingdon, J. W. (2010). Agendas, alternatives and public policies (2 ed.). Upper Saddle River, NJ: Pearson. Patton, R., Zalon, M., & Ludwick, R. (Eds.). (2015). Nurses making policy: From bedside to boardroom. New York, NY: Springer; Silver Spring, MD: American Nurses Association.